Ampere hours, voltage, Li-Ion, NiCd… all these are terms that you might hear thrown around when you are looking at purchasing a new cordless tool. But what does it all mean? How do you know when the salesperson has no idea what they are talking about and just wants the commission? 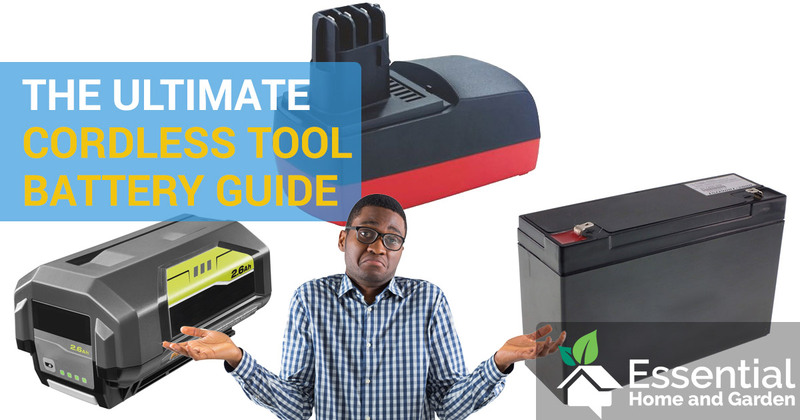 Well, let’s give you a bit of an education and go over the different battery types, ratings and everything else you need to know regarding batteries for cordless tools. That way you can be armed with all the info you need to make an informed decision. Which Battery Type is the Best for Cordless Tools? If you told a carpenter that you relied on nothing but a battery drill to do all your screwing and drilling jobs 15 years ago they would have laughed at you, these days cordless drills, nailguns and other such cordless tools are their most used devices. Battery technology has improved vastly over the past decade, and in some cases, the tools that they power can perform just as well as a corded tool. One of the main problems with batteries in the past was their ability to last the distance. There is nothing more annoying than having your battery run out of juice halfway through a job. Modern-day Li-Ion batteries can provide power for extended periods of time, and also recharge quite quickly – making them a worthwhile investment. The cordless tool industry has grown exponentially since the release of the Li-ion battery, mainly because of the vast improvement over the other older battery types. Yes, it is true that some of the other battery types listed in this article are outdated, but they do still have their uses and they are still sold with some cordless tools such as cordless lawn mowers. The super quick answer: If you want the quick answer as to which battery type is best, then you will probably want to go with a Li-ion battery. Of course, there are many other things to consider, if you want to learn a bit more then please keep reading. When you are shopping for a cordless tool, you will notice that you are bombarded with different battery specifications. Well, surely it is easy right? Just choose the biggest numbers and you have the best battery? While this seems like the obvious answer, it does depend on numerous factors….. which we will look at. Let’s quickly explain some of the most commonly used terms when it comes to cordless tool batteries. What does AH mean? What does it mean when the AH or a battery is (X). These are some of the most common questions we get. And it actually isn’t that complicated. Ah, or ampere-hour is the total amount of charge your battery can deliver in one hour. E.g. Under ideal conditions, a cordless lawn mower that continuously draws 2.0 amperes (amps) of current will drain the total charge of a 2.0Ah battery in 1 hour. So by that logic, a 4.0Ah battery should last for 2 hours in the same electric mower. This is all assuming of course that the mower draws a constant 2.0A and that conditions are ideal for the battery – which never happens in the real world. There is another thing to consider here, and that is the fact that a 4.0Ah battery is not necessarily going to last twice as long as a 2.0Ah battery will, in some circumstances it may actually last more than twice as long. It all depends on the type of battery, how it is wired up and the control circuitry in the battery itself. But you can still use the basic reasoning mentioned here to roughly judge how long a battery might last. So what does AH mean on a battery? To put it simple Ah is a measure of how much charge the battery can provide. A simple analogy would be the size of the fuel tank in a car. The voltage (V) rating of a battery is a measurement of how much power that battery can provide. To put this in very simple terms, the higher the voltage the more powerful the battery. Some cordless devices require more power to run, so a cordless drill that is designed to drill through tough timber is going to need more power than a drill that is only designed to do light work. Yes, higher voltage generally means the tool is more powerful – but it also means more weight in the tool and these higher voltage tools also generally cost a lot more. It all comes down to choosing the right tool for the job, remember that bigger is not always better. The memory effect occurs when a battery is constantly partly drained, then charged without being allowed to fully discharge. The name comes from the fact that the battery remembers how much of its charge was drained before being charged and then uses the shorter charge period as its new capacity. Not all batteries suffer from the memory effect. Cycle life is a measurement of how many times a battery can be charged before losing the ability to retain energy. For example, Li-Ion batteries in cordless tools generally have a cycle life of 300-500. So theoretically you could charge a Li-Ion battery at least 300 times before it would need to be replaced. After a cordless tool battery has been charged, if the battery is not used immediately then it starts to slowly lose its charge. Some battery technologies have a much faster self-discharge rate than others. Keep in mind that a faster self-discharge rate is not always bad – if your tools are never stored away for long periods between use then you probably won’t care about the self-discharge rate at all. Self-discharge is measured in percentage of charge lost per month. A deep discharge is allowing the battery to completely drain of energy through use. This can be problematic for some battery types (not all) and can severely reduce the batteries cycle life and capacity. On the flip side, there are some battery types that should periodically be allowed to deep discharge in order to maintain a healthy battery. 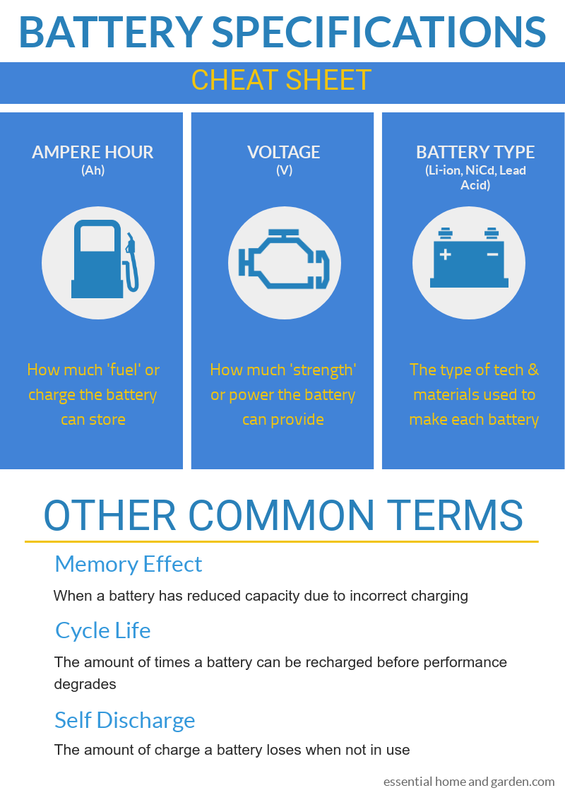 Before we go into too much detail, let’s take a quick visual look at the difference between the 4 main battery types. We often get asked which batteries are better or which type is better. 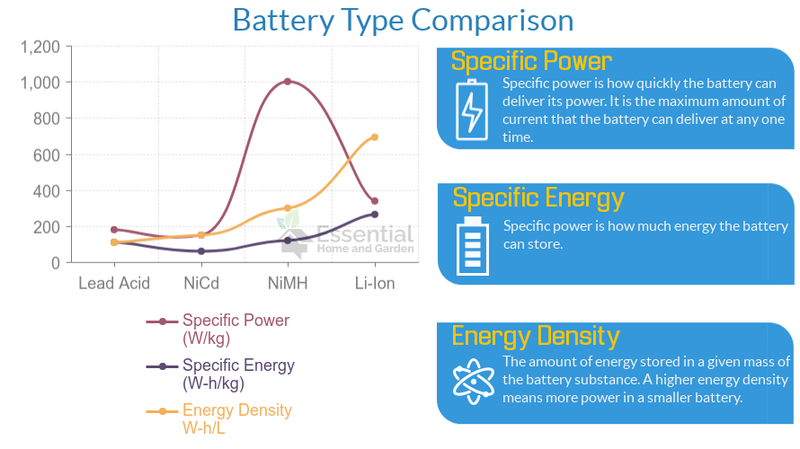 Well we have tried to make it simple to compare the different battery types with this handy image below. Ok, that’s great – it looks pretty hey? For high current applications (digital cameras, high power torches etc) NiMH is clearly the best choice. This is because NiMH batteries are capable of delivering a high burst of power when needed (The specific power number is huge). But…The amount of power they can actually store is lower than a Li-Ion battery. Lead Acid and NiCd batteries are pretty much obsolete these days. So the long and the short of it is: A Li-Ion battery is smaller and can provide a lower current for a much longer period than a NiMH battery. But a NiMH battery can deliver high bursts of current when needed. Now we will dive a bit deeper into each battery type. The Nickel Cadmium battery has a long history, in fact it was first invented in 1899! Of course, it only started being mass produced in 1946 and it grew in popularity from there. They are generally outperformed by both NiMH and Li-Ion batteries but are still useful for some jobs today. Brought into mass production in 1989, NiMH batteries are a much newer technology. They are an improvement on NiCd batteries in many ways, the main points being that they are less toxic to our environment when disposed of, and have significantly improved capacity (Ah). They do of course come with some downfalls which can be seen in the following sections. If your NiMH batteries have developed a memory effect or capacity has been reduced, then it is likely you can recondition them by following this guide at rechargebattery.com. Entering commercial production in 1991, the newest technology in batteries for cordless tools is the Lithium-Ion battery (Li-Ion). As far as we are concerned, Li-Ion batteries are the best choice for cordless tools, whether it is a cordless lawn mower or a cordless drill. Ah rating: 3.0 Ah and up! Lead-acid batteries are not commonly thought of when it comes to cordless tools, but they are still quite common in cordless lawn mowers so we have decided to give them a small section in this article. The lead-acid battery was first put to commercial use in train carriages in 1859, it has obviously had multiple revisions and improvements since then but is still widely used today for a number of applications. You will typically find these used as cordless lawn mower batteries and batteries for the starter motor in ride on mowers. This is because these tools have much more room for a larger and heavier battery. In the past, you could mix and match different chargers with different rechargeable batteries. These days most cordless tool batteries are designed to work with a specific charger, especially those with Li-Ion batteries. 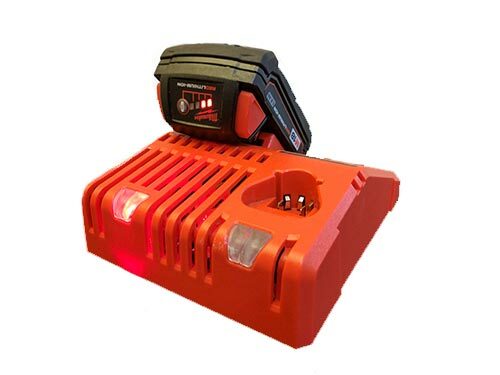 You will find that Lead Acid batteries can be charged in many different ways, but it is always best to follow the manufacturers instructions and use the charger that the manufacturer provided with the tool. If I could turn on my crystal ball and tell you exactly where battery technology was heading….I would! Unfortunately, my crystal ball is in being repaired! But, I can tell you what I do know and what some of the worlds most renowned battery experts know. The truth is that at the moment, there is no magical battery technology being developed that will change the world. While there are some theories of technologies that MIGHT work – there really are no working models for the moment. There is, however, lots of money being spent on improving Li-Ion battery tech. This is due to the rise of electric cards and stationary battery energy storage (for storing energy generated from wind and solar power). So we should see a new generation of Li-Ion batteries being developed that will slowly take over the market as manufacturing ramps up and costs come down. Q: Can you recondition power tool batteries? A: Yes you can, there are a few ways to give your batteries new life. Some methods are mentioned in this post. Or you can completely rebuild your battery – although be very careful with this as it can be dangerous. Q: How long do Li-Ion batteries last? Li-Ion batteries do have a cycle life of up to 1,900 cycles. Generally though the Li-Ion cells will last 2 – 3 years before needing to be replaced. Thanks so much for your simplistic description of the variety of batteries !!! Wish this simple teaching was taught to salesman!! Kudos. Thanks! It was a great help! Hi Joy! Thanks so much for your kind words. I am glad that you found the article helpful. Feel free to share it with anyone else you think may find it useful. I have had several Nicad drills. They last only so long even if not charged and used regularly. Over a period of a few years the batts. will not hold a charge. Yeah they do that. Li-Ion does work a lot better and for a longer period of time. can you reset cycle life on Milwaukee battery or other type?